"He said if I wanted back in to come see you…" Neon has released the first official trailer for an indie drama titled Little Woods, the feature directorial debut of up-and-coming filmmaker Nia DaCosta. This film originally premiered at the Tribeca Film Festival last year, where it won the Nora Ephron Award. 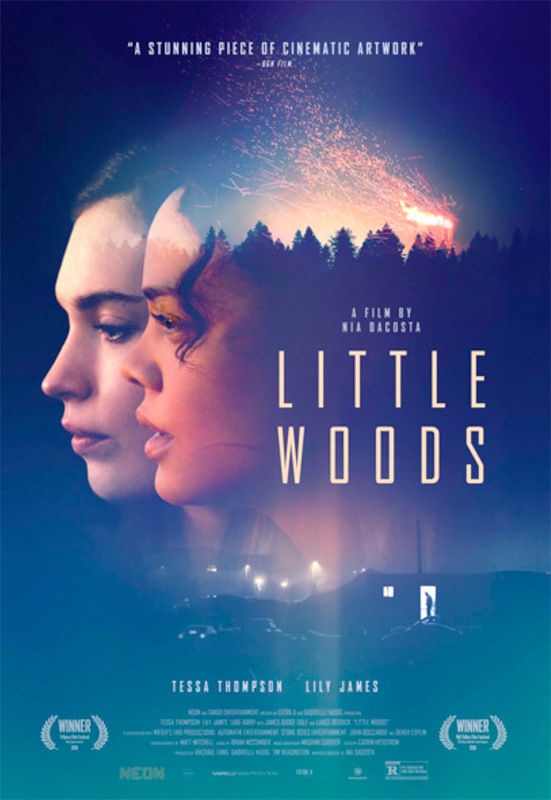 Described as an "emotionally-charged small-town modern Western about two women in rural America," Little Woods stars Tessa Thompson and Lily James as sisters struggling to survive in their small town. "Their sister bond, beautifully exemplified by the authentic and lived-in relationship, is what keeps them connected but can also tie them down." The indie cast also includes Luke Kirby, James Badge Dale, Lance Reddick, Elizabeth Maxwell, and Luci Christian. The two lead performances in this look enthralling and fierce. Ollie (Tessa Thompson) is a reformed drug runner now living in an economically depressed small town in North Dakota, who was caught coming back from Canada with medicine for her terminally ill mother and has been toeing the line ever since. After her mother dies, Ollie’s sister Deb (Lily James) shows up on her doorstep with a hungry child and an unplanned pregnancy. Ollie can only see one viable option: quickly raise money to pay back the bank and hold onto their mother’s home, so Deb can raise her family safely away from her abusive ex. But to do that, she’ll need to return to the dangerous way of life she thought she'd left behind. Little Woods is both written and directed by filmmaker Nia DaCosta, making her feature directorial debut after making a short film previously. This premiered at the Tribeca Film Festival last year. Neon will release DaCosta's Little Woods in select US theaters starting April 19th this spring. Interested?